Revisiting the consequences of becoming a “covered expatriate” for failing to comply with Section 877(a)(2)(C). There are many unanswered questions about the tax consequences of Sections 877 and 877A. The language in the statute is not clear as to its meaning for those who file incomplete, fail to file, or fail to “timely file” IRS Form 8854. Be careful to understand the meaning and how the IRS interprets the law. One of the greatest risks for anyone who thinks they will not be a “covered expatriate” because of the asset test or income tax liability test, is the certification requirements set forth in Section 877(a)(2)(C). Anyone who renounces their citizenship at the Embassy or Consulate will find that process relatively easy. See forms. However, no one at the U.S. Department of State will provide tax advice or try to interpret the meaning of Section 877(a)(2)(C). Indeed, the Foreign Affairs Manual used to read to the person taking the oath, simply provides the standard overview language of “special tax consequences” arising form the renunciation. The provision is clear that anyone who does not satisfy it, will be a “covered expatriate” and hence subject to the taxation and reporting requirements under Sections 877 and 877A and 2801. Also, the IRS has its own interpretation of what it means to satisfy the requirements of Section 877(a)(2)(C). See, Does IRS Notice 2009-85 regarding expatriation have the “force of law”? Posted on April 14, 2014. Did not fully complete or file the information set forth in IRS Form 8854? Did not convert the values of the assets and liabilities from the foreign currency where they were held into U.S. dollars? 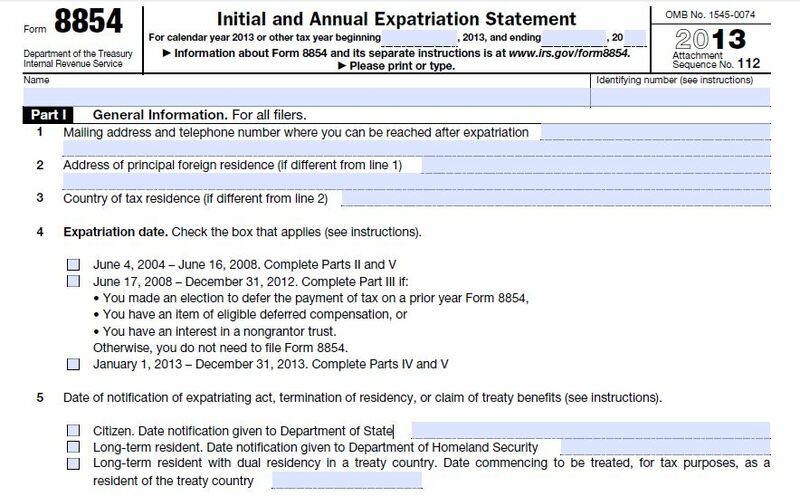 What if the former USC or long-term resident does not file a dual-status return for the part of the taxable year that includes the day before the expatriation date? What if the date of relinquishment (not renunciation) is a date prior to the year when the last tax return is required to be filed pursuant to IRS Notice 2009-85? For instance, what if the relinquishment date is October 1, 2009 (as reflected by the final Certificate of Loss of Nationality from the U.S. Department of State) and the former USC has to decide how and when to file in the year 2014? This is worth understanding well, before rushing off to take the oath of renunciation at the U.S. Embassy or the U.S. Consulate. What are Academics Saying about the G20’s Efforts to Crackdown on International Tax Evasion? Many Canadians have expressed frustration with U.S. tax policy of worldwide taxation of U.S. citizens.